Achieving work-life balance is hard enough, and adding in the fact that you’re working from home adds a whole dynamic to the juggling act. How can you possibly balance these two major components of your life when they are taking place in the same location? 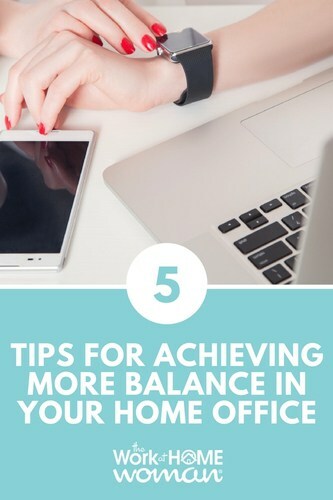 This article discusses five guidelines to help you achieve balance in your home office by establishing boundaries; learning how to deal with crossover; staying motivated and connected; and setting realistic, attainable and measurable goals. Any work-at-home guru will put boundaries at the top of their tips to succeed in a home office environment, and for a good reason. You’ve got to be organized, know what you’re doing and when, and be able to verbalize this structure so that you – and everyone else in your household – doesn’t end up overworked, under-appreciated, or separated from the world around them! One of the most overlooked yet critical boundaries is knowing when to disengage. In today’s hyper-connected world, we can do crazy things, like schedule conference calls after dinner or check and answer emails at 11 p.m. Shut your office door, log out of your email, put away your smartphone! If it comes down to it, write yourself a sticky note and be as confrontational with yourself as you need to be. You alone have the power to hold yourself accountable for setting boundaries and sticking to them. We all wish we could find the magic trick that gives us balance between our work and personal lives, but in reality, work-life balance is about careful coordination and blending. One helpful technique to handle crossover is to end your working day well. Create a new to-do list for the next day at the end of each day, so you reduce the amount of time to get organized each morning. Or, create an “end of the day” ritual to demark leaving work and beginning personal time. This can be as simple as changing clothes or engaging in some calming exercise. Develop a clear transition from one mindset to the other, and establish this routine as a habit. Accept that there will be crossover. Co-workers and colleagues become friends, and children become employees. It’s okay to blend the two together, and you get to decide what and how much you allow. The key to staying happy working from home is to stay motivated. Each person has their own unique set of motivators, whether it’s extra time off, a trip to the bakery or shoe store, or a relaxing bubble bath in the mid-afternoon. One thing is the same for all of us: we work hard and deserve to be rewarded for it! You know what reward is going to speak to you, and what’s going to let you kick your feet up at the end of the day and take pride in your accomplishments. So, choose your reward and when you earn it – take it! Working from home can become isolating if you forget to pay attention to maintaining social connections and networking. Take advantage of online networking through groups such as Twitter, Facebook, and LinkedIn to develop a network you can communicate with virtually. Look for other work from home groups in your area, or stay-at-home mom groups that engage in a weekly meet-up for lunches or coffee. Larger cities even have pay-to-work office space than you can rent by the hour in traditional office environments if you have a craving to work a “real” office for a day or two. One fun idea for work from home women when you need to get out of your home office is to be a business traveler in your hometown. Take your work on the road to a local coffee shop, restaurant, or hotel lobby and work there for a day. You never know whom you might meet! Goals define benchmarks for you to use as measurements of how well you’re balancing your work and life. Reaching your goals provides the opportunity to celebrate your successes with your reward! They also provide you with insight into what areas you struggle with and can help guide you with adjustments in your balance to keep you on track. Be realistic – know what your responsibilities and obligations are, how long they take you to complete, and when they are expected to be completed. Know your work style and when your best times are to focus and be productive. Remember, your family and personal life are stakeholders in your success too, so don’t forget to factor them in. Be attainable – don’t set yourself up for failure by developing an overly rigid or complicated schedule or set of expectations. Don’t start off by putting yourself in reactive mode by overreaching. Design an attainable goal plan that fits your lifestyle. You can modify it later as you find your rhythm. Be measurable – develop ways to measure your work: the time it takes, the time you lose on distractions, etc. Later you can sit down, see a pattern in your work, and have the information you need to tweak your schedule accordingly to keep your life as balanced as possible. Being satisfied and productive in the home office environment is a learned skill that takes adaptation and personalization, much like working in any other environment. Just like learning the specifics of your situation in any workplace, flourishing in your home office requires just as much – if not more – honesty with yourself about what you value and how you really work, your goals, your expectations, and your boundaries. Using these five guidelines will assist you in setting yourself up to create a fulfilling experience working from home. Lindy has a BS in Business and an MA in Leadership. She works from home full-time as the Editor-in-Chief of Radiant Advisors and faculty member of her Graduate Alma Matter. Lindy is also the founder of Granny Smith Magazine and a regular contributor to Millennial Leader. Visit Lindy on Twitter @lindy_ryan. Great feedback, everyone! I’m so glad you found value in the tips! These are great tips! Some of them translate well for those of use who still work in the cubicle maze as well, such as getting motivated and setting goals. Thank you for sharing! Hi Karen – Glad you enjoyed Lindy’s article! Hi Kathleen, Sticking to a schedule is key for me. If I didn’t, I’d have a hard time making working at home work.